Steve Suggett has assisted with and taught bushcraft courses since 2006. Prior to joining the team at Frontier Bushcraft, Steve worked at Woodlore Ltd.
Steve is well-travelled and this experience grounds Steve's bushcraft and outdoor skills in the practicality of making journeys. Steve was born in Tanzania but raised in Durham. In his travels, Steve has returned to Africa, including trips to The Sudan and Botswana. Steve also spent a spell living in Australia, where he worked in a gun shop, selling firearms. While there Steve spent time exploring the Australian bush, rain-forest, mountains and canyons. As well as studying under and working for Ray Mears in the UK, Steve has travelled to Canada to learn from Mors Kochanski. 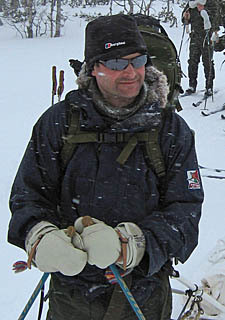 Steve's interest in learning about bushcraft of the north and cold weather travel has also taken him to Norway and Arctic Sweden on a number of trips. Steve continues to develop his bushcraft and expedition skills, particularly enjoying applying this knowledge to journeys on foot and by open canoe. Steve is great at finding equipment (old or new) that lends itself to use on bushcraft courses or expeditions. He also has an uncanny knack of unearthing obscure books with relevant content. Those who know Steve will tell you that he always has something new, different or surprising in his rucksack.